Chinese-Pakistani joint military exercise "Greater China," which consists of China, Hong Kong , Macao and Taiwan, is becoming an increasingly integrated and powerful political unit. Hong Kong became part of China in July 1997; Macao in 1999. Taiwan is one of the biggest investors in China and most Chinese view Taiwan as an island province of China. In the year 2000 the gross domestic product of Greater China reached $9.8 trillion, exceeding $9.7 trillion GDP of the the United States the same year. There are virtually no fences along China’s 20,000-kilometer-long border.China has solved border disputes with Russia, Mongolia, Vietnam and Myanmar but has work to do to settle its disputes with India. While the United States has been preoccupied with terrorism, Iraq and the Middle East---neglecting Asia---China has stepped up its presence in Asia, filling the vacuum. China has been able to undercut is neighbors in key export markets. Many of the sectors that China’s is doing well in---light industry, electronics, chip making---are sectors that other Asian countries had hoped to do well in but aren’t doing as well in as they hoped because of China. In the 1990s, China’s exports to the United States tripled while those of Japan fell by half and those of the four tigers’south Korea, Taiwan, Hong Kong and Singapore’shrank by a third. Central Asia is known to Chinese as Serinda. China has been very generous to the former Soviet states there, giving Kazakhstan a $10 billion loan when it was strapped for cash during the global recession in 2008 and 2009 and providing money for infrastructure protects in Turkmenistan and Kyrgyzstan. China and the former Soviet countries Central Asia have agreed to forge stronger economic ties and combat terrorism together. Border disputes that date back to Soviet era have largely been ironed out. In April, 1996, China, Tajikistan, Kyrgyzstan, Kazakstan and Russia signed a treaty aimed at maintaining peace in the region. The agreement stipulates that the "military forces of the five countries will not attack each other, will not conduct military exercises aimed at each other, plus inform each of scope of military exercises and keep friendly ties." There is also a lot of resentment toward China in Central Asia. During violent demonstration in Bishkek, Kyrgyzstan in the spring of 2010, after protesters torched the president’s office and other government buildings they then turned their attention to a Chinese-owned shopping mall, lootting, smashing and then burning it down. Local Kyrgyz industries have suffered as a result of cheap imports from China. Most Central Asian states are also said to have reservations regarding Russia's policy, due to the large number of ethnic Russians living in this “near abroad” area and their “cautious neutrality” also shows the growing influence of China in this traditional sphere of influence of the Russians. In September 2003, Russia, China and the countries of Central Asia agreed to set up anti-terror bases in Uzbekistan and agreed to use the Shanghai Cooperation Organization as a vehicle to fight terrorism and Islamic extremism and boost trade in the region. 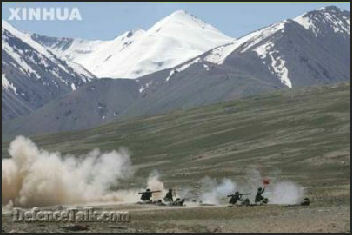 Troops from these countries held a series of military drills in the Xinjiang and Kazakhstan deserts. A military exercise in the Urals in August 2007, featured 6,000 troops from China, Russia and four countries of Central Asia. China provided Sri Lanka with key funding---including free use of six fighters---that help it finally defeat the Tamil Tigers in 2009 after decades of war. In return China was permission to build a $1 billion container port and base in Hambantita, Sri Lanka to use to reload ships and as a docking and refueling station for its navy. The port is part of China’s “string of pearls” strategy in which China is building a series of bases on strategic shipping lines between east Asia and the Middle East that also includes bases and ports in Gwadar in Pakistan, Chittagong in Bangladesh and Sittwe in Myanmar. Gatot Machali, the director of the station accused of being the broadcasting base, said he and two other Indonesians founded the station on their own initiative and with their own cash. It operates from a hilltop villa purchased by one of the founders, a businessman. Revenue from advertising is thin, but the station still employs seven full-time staff members. Erabaru, or New Era, Radio broadcasts largely in Chinese, which is incomprehensible to most Indonesians, including Machali, but is understood by Batam’s community of ethnic Chinese and residents of nearby Singapore. Much of its daily programming avoids politics, but its news reports sometimes feature reports on Chinese repression of Falun Gong activists and others. It has also broadcast the group’s “Nine Commentaries,” a lengthy denunciation of the Chinese Communist Party.”If we just broadcast Falun Gong stuff all the time, it gets boring,” said Raymond Tan, one of the founders. When the station first applied for a license in 2007, it got a preliminary thumbs-up from the Batam arm of the Indonesia Broadcasting Commission. But after Chinese diplomats protested, officials in Jakarta rejected the application. Agnes Widiyanti, director of broadcasting at the Communications Ministry, said Erabaru Radio lost out to other stations because it broadcasts largely in Chinese, in violation of Indonesian law. Erabaru paid no heed and kept on broadcasting. Fed up with the defiance, authorities raided its studios last year. Erabaru shut down for six days and then started up again. Machali got a leaked copy of the letter and laughed off China’s demand. “It was ridiculous,” he recalled. In 2011 he went on trial for illegal broadcasting, the climax of a long campaign by Indonesian authorities to shut down Erabaru Radio, The tiny station---still on the air despite a police raid on its studios, years of legal battles and the confiscation of transmitting equipment---stands at the center of some very big questions: How will a rising, authoritarian China use its clout, and how will other nations, particularly democracies including Indonesia, respond? At a sentencing hearing in July 2011 in Batam, the prosecutor asked a panel of three judges to offer Machali a deal: He pays a modest fine of $5,800, gets a year’s probation and stays out of jail---so long as he abides by the law and stops what authorities view as unlawful broadcasting. Media advocacy groups in Indonesia and abroad accuse Jakarta of bowing to Chinese pressure. Indonesian officials deny this. “We have not been influenced in any way,” said . Widiyanti, the broadcast chief.